Joan, age 76, of Dansville, MI, passed in peace after an illness on Monday, January 28, 2019. 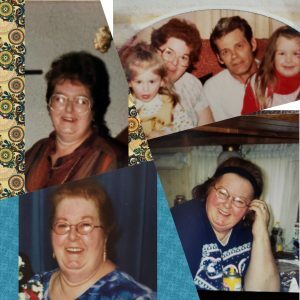 She was preceded in death by her husband, Don Brown, and is survived by her 2 daughters, Christina (Jason) Tolliver and Dianna (Steve) Brownridge, and 8 grandchildren, Bonny, Cody, Donald, Talan, Cynthia, Emily, Tyler, and Stephanie. She was born on April 7, 1942, in Lansing, MI, and raised on a farm in St. Johns. She became an LPN after high school and married her husband in 1975. Together Joan and Don became foster parents and Joan ran a daycare. She left her mark on many children. She loved to crochet blankets for people, watch NASCAR, ride horses, and shop with her girls. She will be greatly missed but always remembered for her beautiful smile and sweet personality. A memorial service will be held at 1:00 p.m. on Sunday, February 17, 2019, at the Bunkerhill Township Hall, 871 DeCamp Rd., Stockbridge. Please come share some memories. Our deepest sympathies to you both and your families. So sorry to hear of this knowing how much love she had shared with so many children and families including ours. I just loved to sit and chat with her when I would pick Megan up from daycare. Her smile was good for the soul, she was my go to for stress relief. Know that she was loved deeply and will never be forgotten. Such a wonderful lady. Joan was my step-mother. Only 9 years between us. We became such good friends. To the girls and their families and Stephanie and Tyler, I am so sorry for your loss. I will remember you always Joan. I loved you for so many reasons. Such a strong woman . I always enjoyed her company and was your welcoming . You will be greatly missed by your nightshift aides . We will be having a memorial for mom at the Bunkerhill township hall, 871 Decamp road, Stockbridge Michigan, on February 17th, 2019 at 1pm. Please come share some memories.